Not far from Stonehenge, and deep in chalk country, through Saxon villages and past dwellings of thatch and flint, flows the Wiltshire Avon one of eight British rivers of that name (it derives from afon, the Welsh word for river). 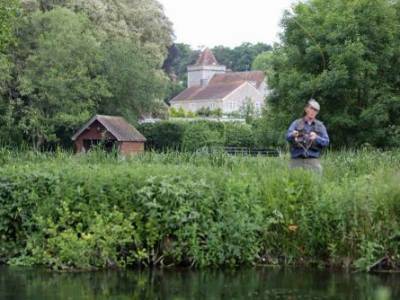 Over the years, I have fished here at Heale House and on the nearby Piscatorial Society water where Stings guard dogs mounted a foray from the far bankbut perhaps the most exclusive stretch is that belonging to Wilsford Manor. The Editor and I were invited along for opening day and were royally entertained by the owner, Miles Darcy-Irvine, and his wife, Lydia. Although now extensively remodelled in their own elegant style, the house has an aesthetic history that is notably colourful. Built in the 17th-century style by Detmar Blow for the Glenconner family, it became the home of that flamboyant artist and epistolist Stephen Tennant, one of the Bright Young Things of the inter-World War years, who held court here to chums such as Cecil Beaton, the Sitwells and his lover Sieg Sassoon. Stephen was the pasha of overblown taste and a poseur of some distinction. His writing paper was pink embossed with pink; he decorated the manor with obsterpot lampshades, silver-painted lavatory bowls and a personally designed zebra-skin pouffe. At one stage, there were 16 gardeners. Mr Stephen languished in bed for the last 17 years of his life, wearing leopard skin pyjamas and face powder, expiring in his dilapidated Bohemian bower in 1987. According to his lively biographer, Philip Hoare, the place had to be exorcised when workmen encountered a male apparition. Although he angled as a youth, Mr Stephen became too exquisite for such matters. 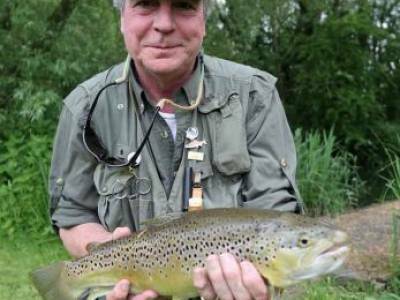 At ilsford today, there are still gilded youths with a taste for the outer and refined beautiful brown trout, some of which are, in fact, not so young, as all the larger fish are released. These canny old stagers will haunt your dreams. 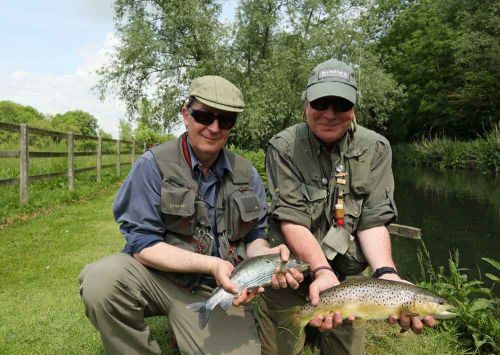 The record here weighed 17lb, said our host, as we nervously knotted on our leaders. April showers and high, tinted water dogged our first attempts. A few reluctant Olives straggled off and it was too early for the Hawthorn. 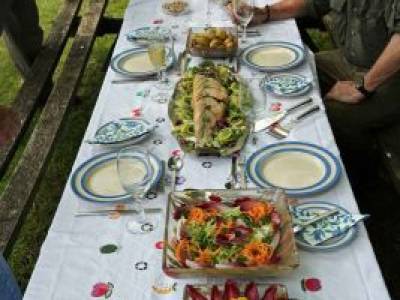 My Parachute Greenwells was ignored, but a couple of fish responded o a small Yellow Humpy in the tantalising run below Dutch Bridge and I managed a nicely timed three-pounder in front of the hut just as our host was arriving for luncheon. When, in my ebullience, I offered the Editor some unsolicited advice about a particular lie beneath a willow, he responded sulphurically through his miasma of Partagas smoke: Ah, yesthe sage of Perthshire. I trust this will not prove my farewell column. In the afternoon, we were guided by our friend Howard Taylor (through whose firm days ere may be arranged). He is a companion who combines expertise with irony and we both took several more fish from the upper reaches. Miles was kindly insistent that we eturn to see his beats at their glorious best and, accordingly, at prime time in early June, we revisited the river. Scooting me down to Big Meadow in his buggy, Miles howed me the gravel lair of a known monster. I tried for him all last season and now hes even bigger, he said. 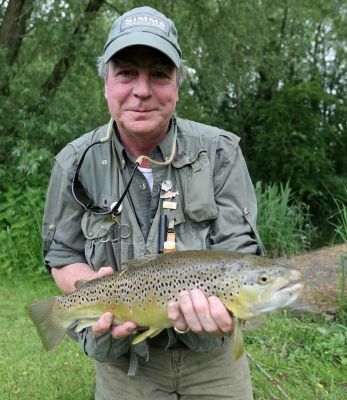 It was close and overcast ideal for a hatch of mayfly and, ndeed, as I looked upstreamwhere the light was high and hazy and the water like furled silkI could hear the clock of a feeding trout. 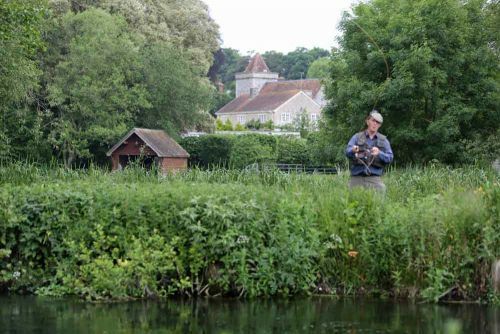 Ive been fishing our chalkstreams since 1966 and I wonder whether, at such times, Earth does have anything to show more fair the waterscape plump with chlorophyll, kempt, but not excessively barbered, ariegated, curvaceous and pleasing to the eye. Small wonder such bucolic bliss the peace of the Edwardians has inspired writers from Ruskin to T. H. White and it is itting hat Lord Grey of Falloden (Foreign Secretary at the outbreak of the First World War and married to Stephens widowed mother) should have rewritten here his Fly Fishing, hat gentlest of our piscatorial classics. This water is lightly fished and it must rate as one of the rarest stretches on which you can rent a day. 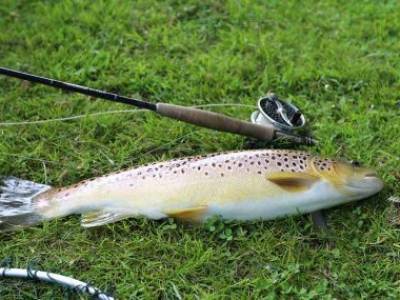 There is a good head of streamlined wild brownies and its been a long while since anything else was stocked. 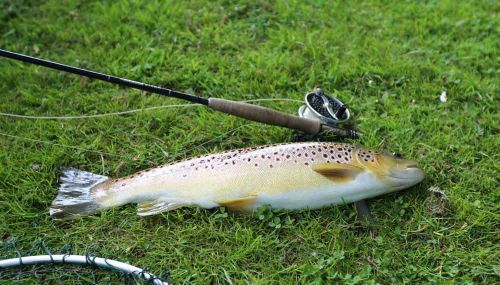 These trout are no pushovers. They are resplendently marked and some have grown to the ize of a decent salmon. 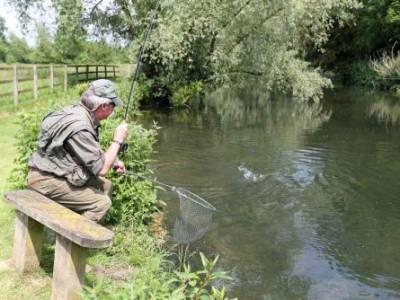 Ive caught a few doublefigure trout and I know what they look like in clear water. I saw at least two during our day, but be well advised to ish with a powerful tippet and keep your wits about you. 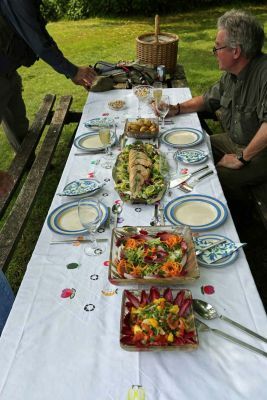 We enjoyed a fabulous al fresco lunchcold Wilsford trout, accompaniedby a ros the hue of Mr Stephens correspondence paper and, all afternoon, the fish came up to Danica duns. When I left this chalkstream idyll at 8pm, Editor Hedges was awaiting the spinner fall at eadmans. Im just not sure where I can get a pair of those leopardskin jim-jams.